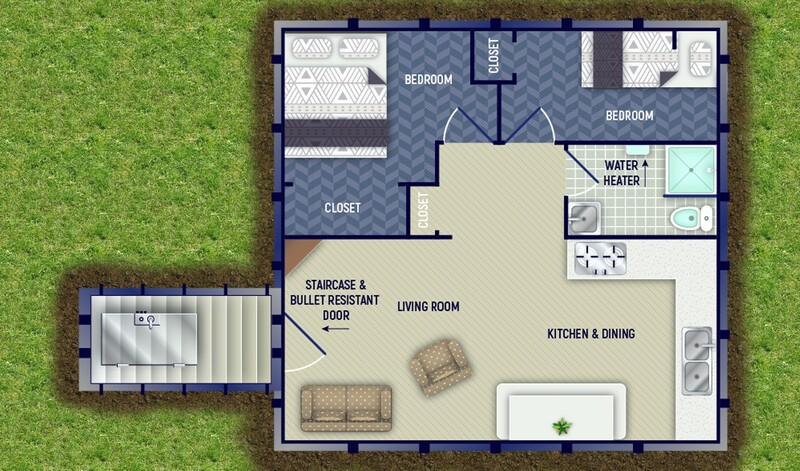 This new 1200 Square Foot Double Wide Design offers a more like home feel. With its open floor plan your Kitchen, Dining and Living Area are conjoined allowing for space utilization. This unit can be customized with our Signature Steel Table and Bench or left open for more traditional home furnishings. Beyond this common area are three bedrooms with walk in closets as well as a spacious pantry for food storage. The Admiral Series Bomb Shelters come equipped with our Bullet Resistant Door, Escape Hatch, NBC Air Filtration With Blast Valves and Overpressure, Full Kitchen with a Double Counter Including a Double Sink, Composting Toilet, Shelving For Food Storage, Water Pressure Pump, Shower, Hot Water Heater, Grey-Water Evacuation Tank, Grey-Water Evacuation Pump, Bathroom Door, 12 Volt LED Lighting, Solar Generator With Battery Supply, 12 Volt TV/DVD Combo, Fresh Water Inlet, 120/240 Volt Inlet, Staircase Handrail, Painted Interior and 150 Year Coating on the Exterior. 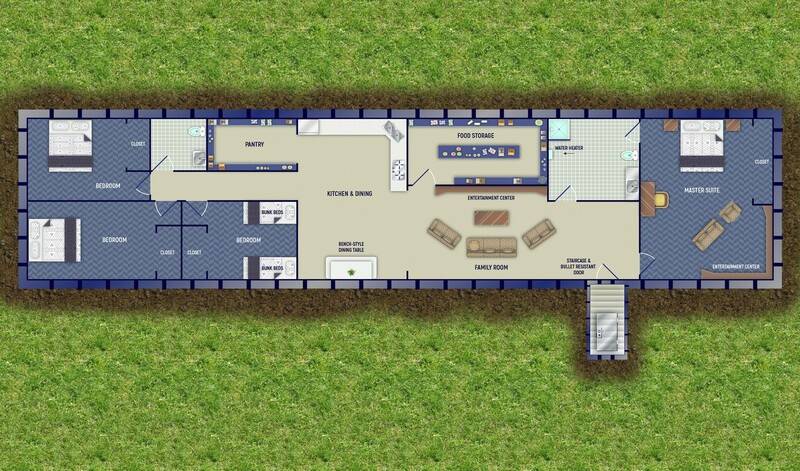 This larger Admiral Series bomb shelter features 3 separate bedrooms with walk-in closets for maximizing storage. Walking into this Admiral Series bomb shelter you will find the door and stairway is bullet resistant, ensuring a safe entrance to your survival shelter. After walking down the stairway, you will walk into the wide open living room. The open style living rooms opens up possibilities for furniture arrangements. The open style kitchen offers more then enough counter top area with a double sink. A dining table with bench style seating can be included, or you can have traditional style furniture for a more comfortable feel. Traveling down the hallway of this bomb shelter you will first encounter a walk in pantry with abundant shelf style storage. To the left you will find the first bedroom that includes a walk in closet. To the right you will find a bathroom that includes a composite toilet, shower, shelving and a tankless water heater. Continuing down the hallway of the bomb shelter, you will find a large bedroom with walk in closet. 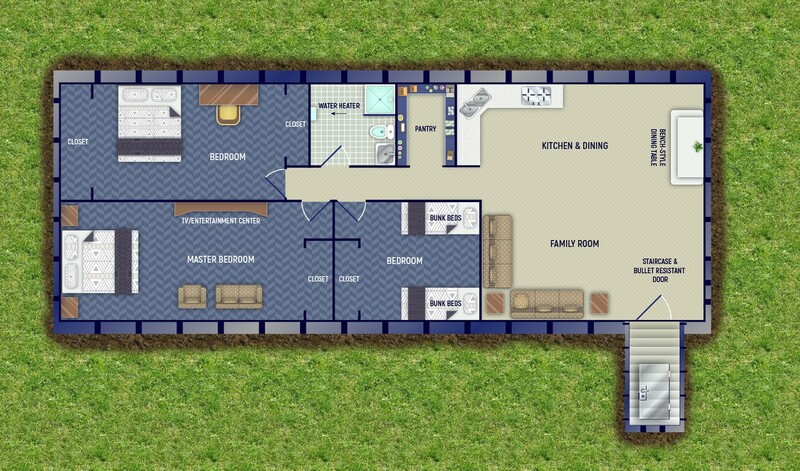 This is extremely large bedroom for a bomb shelter and allows for an endless possibilities for furniture arrangement. Going into the last bedroom, you will find a spacious room with large walking closets. If you don’t know its there, you would never find the escape hatch with hidden access door. The escape hatch provides a great last line of defense for your bomb shelter. 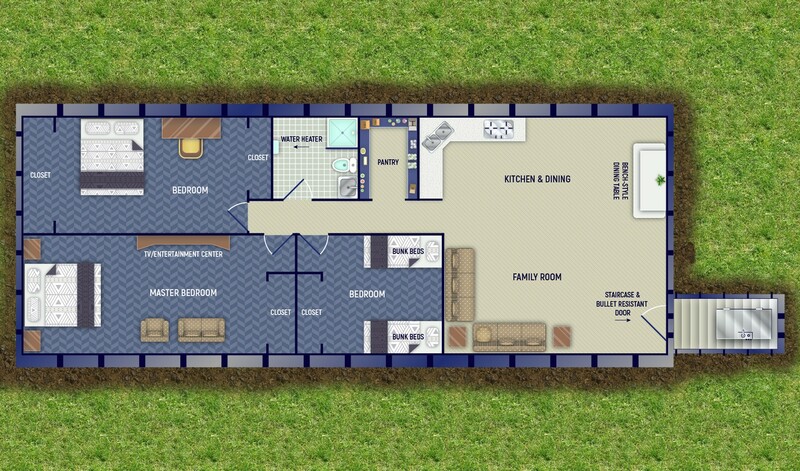 The Admiral Series bomb shelter is unique in that it offers an open floor plan while being able to provide your family with an ‘off-grid’ lifestyle.